Dr. Huggins and Dr. Levy assert that a large number of disorders are, though often incurable, easily preventable. He proposes that multiple sclerosis, lupus, leukemia, chronic fatigue syndrome, Parkinson's disease, many mental disorders including Alzheimer's, and even major diseases like breast cancer are caused, in part, by the toxins we place in our bodies. Where do these toxins come from and how do they get into our bodies? You my be surprised to find that you have actually paid to have them put there. These dangerous materials--mercury, cadmium, beryllium, nickel, and others--are used in everyday dentistry to make up the fillings, root canals, and bridgework in our mouths, and are supposed to be "safe." But are they? Uninformed Consent presents cases of toxic poisoning--of depressed immune systems and inexplicable illnesses--to toxins entering the bloodstream from the heavy metals in dental materials. The authors also discuss the hidden truths that the dental industry in America doesn't want to talk about, and the real reasons the dangers of these materials have been suppressed and ignored. Dr.'s Huggins and Levy implore the reader: "Don't leave your health in your dentist's hands and assume that all will be fine. Become informed and take an active role in your health. Know what will be implanted in your mouth. You must decide at the outset what is more important to you--the life of a filling or your life." 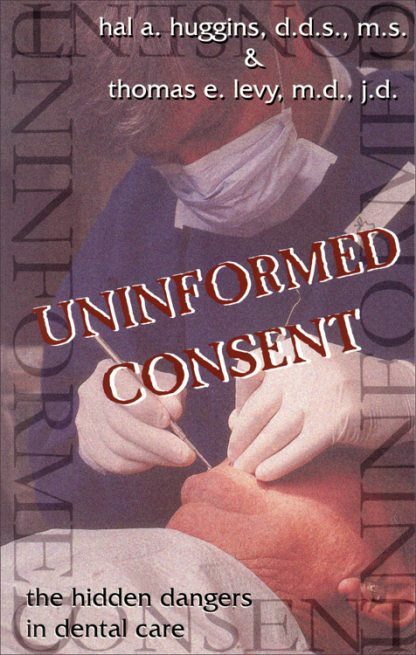 Uninformed Consent will give you the facts so that you may take responsibility for your dental--and complete--health and wellness.